SOS Children's Villages has been working in the capital of Azerbaijan since 2000. Baku is a city of contrasts - in spite of the city's visible development, one quarter of its population lives in poverty. Our organisation is providing support to families so that they can stay together, as well as loving homes for children who have lost parental care. Baku, the capital of Azerbaijan, is located on the western shore of the Caspian Sea. The city has been growing in recent years, and it is now home to around two million people. Baku is the economic, political and cultural centre of the country. The production, processing and transportation of oil are the biggest economic activities, employing many people. 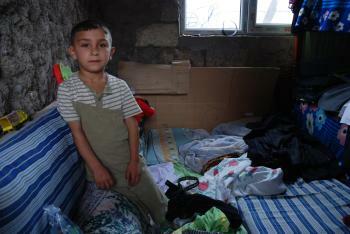 The situation regarding poverty and access to services is better in Baku than in other areas of the country. However, the cost of living is high and around one quarter of the population of the city exists below the poverty line. Most of these people live in the run down concrete tower blocks that were built during the communist regime prior to 1992. Among those living in the worst housing conditions, and with little hope for a brighter future, are the hundreds of thousands of internally displaced people who have arrived in Baku as a result of conflicts in their home areas. Due to the high unemployment rates outside of Baku, many people come to the city in search of work. Their dream jobs often fail to materialise, and they end up working in casual, badly paid and unprotected jobs. The city has one of the highest official rates of unemployment in the country, and only a small proportion of those without a job receive benefits. The high unemployment and inflation rates in Azerbaijan have affected the lives of children; many of whom end up losing parental care. At present most of the children who cannot live with their families end up living in state-run institutions. SOS Children's Villages provides an alternative by providing family-based care for vulnerable children. The municipal authorities donated the plot of land where our organisation is based, 14 kilometres outside the centre of Baku. Due to the increase in number of children losing parental care, we have created more family homes and extended the kindergarten so that more children can be cared for. SOS Children's Villages collaborates closely with local families to prevent children from losing the loving care of their parents. Our organisation works so that children develop healthily by ensuring they have access to essential educational, nutritional and health services. We support families with income generation and parenting skills so that they can protect and care for their children. We also strengthen support systems for vulnerable families in the community. Since summer 2005, we have been running a Playbus, which goes to public parks, hospitals, orphanages, and tower blocks. Children, many of whom have recently arrived in Baku, can take part in different creative activities such as theatre, dancing or crafts workshops. Educational games teach the children about their rights. At the same time the Playbus team shows parents and teachers new teaching methods and ideas. In Baku we also run a kindergarten, where both children from the neighbouring families and those from the SOS families can be cared for during the day. We work closely with the local schools to enhance the skills of teachers and we support individual children by offering tuition in areas where they are struggling at school. When children can no longer be cared for by their parents they can find a loving home with one of the SOS mothers. There are 14 SOS families who can care for up to 91 children. When children are ready to leave their families, they can move to the SOS Youth Programme. The young people can live here while they attend further education or training, and with the help of qualified staff, they learn to shoulder responsibilities and make their own decisions.